I wrote this as a part of the btfchallenge. It is also a yuletide nyr fic. It is based on a short film that is 100% worth the 15 minutes it takes to watch it. This is a hard sci fi story. No magic. No technoloigy indistinguishable from magic. Just a good, old fashioned Orion Drive. In the days before the Kestros IV left System Sol forever, final preparations are made. Me, about an hour before I started sifting compost today - Honey, have you seen the pitchfork? DW: It's probably in the shed out back. Me: It's not. I looked. 11:33 am - NaNo draft done! Three and a half months after the end of NaNo, I have now finished the first draft of my Nano Novel!!!! It is clocking it at 81,160 words. -Right now the thing is 80k with no chapter breaks. Look at where natural breaks occur. Look at where I can outright delete stupid stuff. Look at what I need that doesn't exist yet. There was a knock and she looked up. Madison was standing in the door to her room, wearing the dark red-orange uniform of a crew member of dispatch and control. Like Skylar she had no dots on her collar. “Ready?” Madison asked. Skylar shook her head, “No,” she said, but she tossed the tablet aside and stood up anyway. The drop was slightly less than it had been on the planet and she constantly felt like she was about to lift off. I am having a tough time with writing these days. I am nearly 6K behind for being on pace for my year goal. But I wrote some today, so that is good. I just want to finish the first draft of Spero. Does anyone else wake up and check the news each morning, wondering if we got into a war or if something else horrid happened over night? It was a good yuletide! I got a story about Syndey from the Pretender - my favorite grey hat from that world of one shining bright light, and a whole lot of dark. Sydney must decide how far to let the Centre go with Jarod. Again. And I wrote two stories - a pinch hit in the Tripods universe - the first time I have ever actually nabbed a pinch hit as opposed to treating people who got sent out on the PH list. The request was for more of Will's POV. Some encounters Will, Henry and Beanpole had on their way to the White Mountains. And my main story was a real treat for me. I matched on Werewolf: the Apocolypse - which meant I got to write what largely was original fic set in the werewolf world. SO AWESOME. The request was for kinfolk. Eric Jensen is the proprietor of a trendy cafe, raising his three kids as a single dad, and trying to have relationship with his boyfriend, Aaron. He is also kinfolk to the Black Furies. I'll give you one guess as to what is the hardest part of his life. 2016 was a different sort of writing year for me. I posted just 10 fanfics this year for a total of 36K of words, but I wrote nearly 200k - which is a lot for me. Most of it was in original works - the novel project I am working on and a variety of short stories that I have submitted various places (and had rejected - oh well). 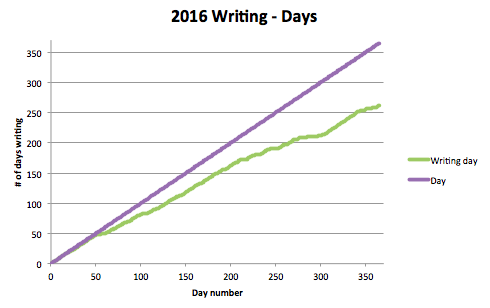 Thanks to getyourwordsout, I have tracked both my words and my writing days this year and I have some cool graphs. 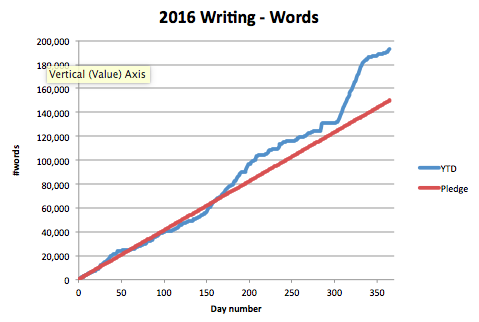 The first one shows my YTD wordcount in blue and my goal (150K) in red. The month where the blue line takes off is thanks to NaNo! I wrote a total of 193,214 words! 3) Participate in (at least) jukebox_fest, not_primetime and yuletide. 5) Write a NYR fic for a microfandom where the main character is this awesome hero/villian sociopath. 6) Submit some stories. Maybe revise Maria and Moesha (the vampire hunters) and try again on that story, somewhere else. Maybe some flash fiction. 4:39 pm - NaNo - Made it! And here are the words that got me there. “How does that help?” Skylar asked, as a vague memory of the chemistry she had had to study as a second year cadet, stirred in her mind. <The engines can be run backwards,> MRGN reminded her. 9:48 pm - NaNo - 40K! 80% done! Today, I hit 40K! 10K to go. I can do it! The rough draft won't be done, but that's okay. The walk over to Common three took a while. The main corridor got increasingly crowded as they walked, filled with colorfully dressed people, mostly in casual clothes, not uniforms. There were groups gathered together talking, there were musicians on the street performing. There were two Dohi who did a tumbling thing together that was kind of incredible to watch. There was a group of Rendann singing a bawdy song. Skylar didn’t recognize any of the lyrics, but she knew the tune, and she knew that it involved verses where each one was more improbable than the last. There was an undercurrent of hilarity, of panic beneath it all. 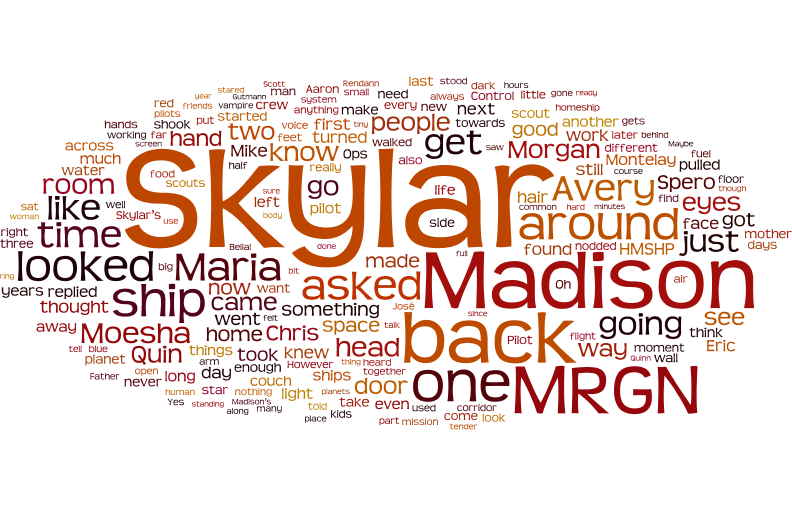 At one point, Madison suggested that they swing over to a side corridor so they could get there faster, but Skylar refused. Adventure begins at home, she reminded herself, twisting the bracelet around her wrist. She needed to see home. To soak it in. 8:59 pm - NaNo update - 30K!!!!!! When I started NaNo - I thought a goal of 1K a day was pretty ambitous (considering up until that point, thanks to getyourwordsout I had been averaging about 400 words a day). However, I am exactly on pace to win NaNo - averaging 1.6-1.7 words a day so far this month. At 30K I also hit the end of the first disaster section of the story. Skylar, my main character, went out on a mission, that mission went badly awry. Here are a few (very rough) words from when she is saved from certain death. The next time Skylar woke up, she was warm. She was in a bed. Well, sort of. She was laying down, with webbing stretched across her, giving her a sense of the bed pressing against her, but her arms were floating by her sides. She opened her eyes. It was bright. She closed her eyes again and tried to remember what happened. She and Morgan had run out of fuel, run out of air. She had been so, so cold. She had thought she was going to die. She opened her eyes again. The glare was no so bad this time. A figure in light green hovered by her side. She blinked her eyes and Quin came into focus. “Hey,” he said with a smile. It slowly began to dawn on Skylar that she was alive. “What happened?” she asked, her voice coming out in a croak. Her lips were very chapped and cracked. Quin picked up a bulb of water and brought it over to her, holding the straw up to her lips. “Here,” he said. She took a sip and the cool water tasted so good. She she tried to grip the bulb in her hands, but her fingers were shaking so badly they slipped off. “You are still weak,” Quin said. With a wet tongue she licked her lips. They stung. “What happened,” she asked again. “Six days?” Skylar said. Oh, god. Madison must be beside herself. And her parents. “Navigation was out,” Skylar said. Quin shook his head. “You got lucky,” Quin said. 8:45 pm - Nano update - 40% done! 1) The story will be longer than 50K when I am done - winning NaNo, will only get me half way through my outline, I think. 2) The revision process on this story will be substantially different than anything else I have ever written. It is going to need a complete and total rewrite. I am not quite sure what that will look like, but my shorter stuff I write and polish. This is going to need a lot more work before it is time to polish. It was all Skylar could do to keep a straight face. Mike had pretty much described the opposite person than she was. She had struggled mightily to master the ship interface. Being still and focused for long times was incredibly hard for her. 8:45 pm - NaNo - 20% done! I hit 11K today! Although some of that I copied and pasted from my character sketches that I wrote before november so I am only going to claim 10K or so. Here, have a few words from the the end of the openning sequence. Avery and Quin walked side by side through the throng, with Madison and Skylar following. “How is Avery doing?” Skylar asked. Quin and Avery were walking close enough that their shoulders touched. “Do you think?” Skylar asked. 7:24 am - Homophones. Shoot me now. "we aren't aloud to ..."
And I found myself staring at those words for several minutes before I figured out what was wrong. 9:27 pm - Nano - 10% there! Here's a snippet of a few hundred words at the 5K mark. Minimal editing has been done. What I have learned so far: It is really, really hard to write about people moving about in zero g. You can't walk. You can't sit. Well, not really. You don't fall. When an explosion rocks your spaceship, stuff doesn't fall out of the places where it was stored - it just sort of slowly floats out. Fortunately, the next chunk of story is, as my favorite sci fi writer DKM says, in drop. The people in the room arranged themselves in a rough sphere around the projector, floating so they all got a good view. After a few seconds, the tube of light vanished and there was Spero, suspended in space. The tenders were on station. The trainees were going through their exercises, but fast. 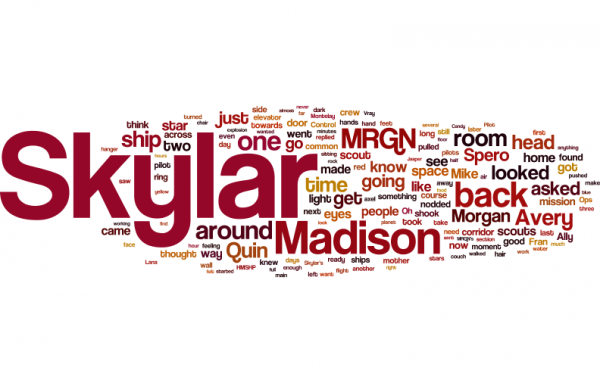 Skylar looked at the timestamp and saw that the time was advancing at two or three times the normal rate. Then she saw MRGN come into view. “That’s me,” she said, as she made her spiraling tour of the space around Spero. “What were you doing?” Jasper asked. “The bow deflector looked funny,” Skylar said. “MRGN wanted to…” but her voice faded out as she thought about the bow deflector. The trainees disappeared into the Spero. MRGN docked. The tenders moved about. And then there was a brilliant flash and the recording stopped. “What happened?” several people said at once. “Wait,” Fran said. She darted back out of the room and the image reset a few seconds before the explosion. The scene moved forward in slow motion. This time, they caught it. One of the tenders working on one of the ring exploded and crashed into the ring. A huge gash was torn out of the ring, with debris flying everywhere. The image goes dark again. “Oh my god,” someone says in the silence. “Fran, replay it again, at half the speed you just showed us,” Jasper said. “How can you say that? There was…” Ambo gestured helplessly at the hologram which was frozen on the last frame, showing debris flying away in all directions. “We don’t know how bad it is,” Jasper said quietly. “It might have just been…” but he fell silent when everyone turned to look at him. 10:34 pm - Nano here I come! 9:06 am - Anyone want to give me some feedback? I am working on a novel. I think most of you know that because I talked about World Building June over on tumblr before. The novel is nominally a present for my kids, but I suspect they will graduate college before it is done. Anyway. I am struggling with the outline. I am not trying for anything innovative - basic hero's journey/three act structure is my goal. I am trying to use the snowflake method of outlining and I would love some feedback. Here is the one sentence summary: A young scout searches for a home for her people. The next step is to write a paragraph summary. Five sentences. First sentence is the setting, then three disasters and the conclusion. In terms of the three act structure, the first disaster is the end of the first act, the second is the midpoint of the second act, the third is the end of the second act and the conclusion is the third act. I have two ideas. Idea #1:The G.Is.S. Spero is a vast generation ship that has been traveling between the stars for thousands of years. (1)Systems can only be repaired so many times, and the hull breech was both tragic and inevitable. (2) Desperate to repair the ship, scouts are sent on dangerous missions which result in injuries and deaths. (3) Defying orders, Skylar takes risks and gets injured, looking for a home. (C) With help from her friends, she gets back out there and finds a planet. However, it occured to me after I wrote this, that my main character, Skylar the scout, does not really have much agency until Disaster #3 and maybe that is too late. So then I thought, what if I move the hull breech tragedy into the backstory? Idea #2: The G.Is.S. Spero is a slowly failing, vast generation ship that has been traveling between the stars for thousands of years. (1) Desperate to repair the ship, scouts are sent on a dangerous, risky mission which result in injuries and deaths. (2) Skylar, realizing the ship needs to be scrapped not repaired, pushes the range of her scout ship resulting in her having insufficient resources to get back. (3) Trying to repair the ship, Skylar crashes on a planet. (C) Once she gets back in space, her scanner picks up the planet of their dreams. This moves Skylar's agency forward to disaster #2 and it more closely aligns with the hero's journey model. However, it reduces the role of the supporting cast substantially because for the majority of Act 2 and 3, Skylar will be off on her own with only "radio" contact back home. Jukebox revealed! That means I can tell you all about the story I wrote. It was a very hard story for me to write, in part because the song it is based on makes a minimal amount of sense. Anyway, here it is. Albert Gutmann had no idea what he was getting into when he decided to try to barter for Joe Belial's soul. It wasn't supposed to be like this... her romantic fantasies about her handsome young teacher had all gone wrong, and she didn't want this anymore. As an adult with two kids of her own a young woman named Sally comes back to her roots in Brooklyn, New York to interview her paternal grandmother and learns a great deal more about herself and her family than she ever expected. 9:29 pm - Writing update! 1) My Les Mis bang fic got posted! The year is 1976 and Madeleine has been in Montrey-by-the-Sea for four years. One day, a man accidentally drives his car into the front of a popular pizza place. Check out the beatiful art Chrissy did! This was a bit of an adventure in multiple POV storytelling. I tried something different than before, with the perspective hopping from one person to another. I'd love thoughts and feedback! 2) I am doing World Building June over on Tumblr. I am working on a world I call Spero, for now. It is an original science fiction world that I am hoping to tell a YA novel-length story for my kids in. The setting is in a generation ship, 100 generations after they left their home planet. 3) I also write some ridiculous CA:CW physics meta. 9:41 pm - Another rejection letter! So, I am trying to decide - do I submit this story somewhere else - or do I post it? I might try one more submission and then just post it. We'll see. I realized I never posted my April writing summary. April was kind of a disaster word-count wise, but I did make some reasonable story progress. I finished a draft of my les mis bb and I wrote a (very short) story for the Be The First challenge. I did not manage anything for MCU, but I still havent seen The Thing so maybe I will. We'll see. I am currently tearing my hair out as I work on my jukebox fic. The song makes no sense. Worldbuilding June is coming up over on tumblr, so I am going to try and dig into Spero again and flesh out the world. The kids will be at Girl Scout Camp the week of July 17, so I am going to try and have another installment of the story ready for then.